Since my teenage years I've had to deal with oily skin; from often problematic blemish-prone skin to a now oily T-zone with a multitude of different skin types. This has resulted in trailing a lot of skincare! I now feel confident enough to recommend the products you should be incorporating into your skin care routine and what you should be avoiding! Below you will find the 5 essentials of a skin care routine for oily skin. 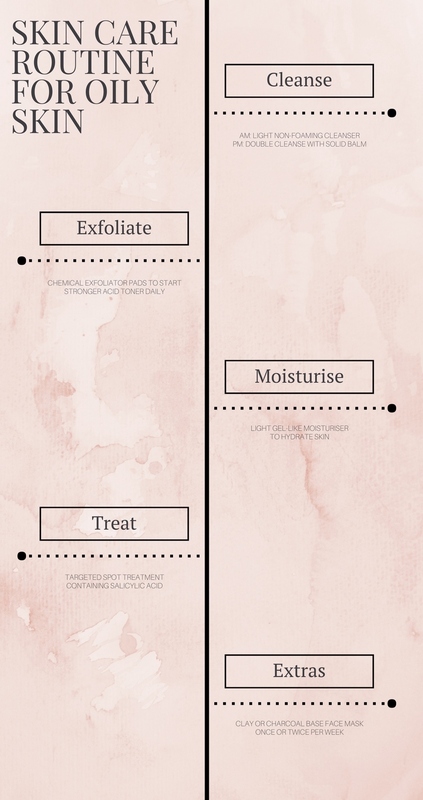 This includes the important step of hydrating the skin with the right moisturiser and exfoliating with chemical exfoliating products instead of with traditional scrub-type products. This will hopefully start off a series for oily skin as I want to share my favourite moisturisers for oily skin, the best clay-based face masks and making the tricky task of finding a good non-pore clogging SPF for the face easier with my top sunscreens picks for oily skin! Keeping skin thoroughly cleansed is one of the most important steps in looking after oily skin. You definitely don't want to strip the skin of its essentials oils as that will only increase oil production and cause the skin to become dried out and irritated. For your morning cleanse a light none foaming cleanser works best. I would personally suggest avoiding face washes which contain Sodium Lauryl Sulfate (find out more about SLS-free products) and alcohol. You basically want to gently cleanse the skin to remove excess oil and sweat from the night before, so the cleanser doesn't need to be harsh and definitely not astringent feeling. Anything containing clay tends to work well for very oily skin types but on the whole I would look at light gel/liquid cleansers aimed at sensitive skin types, many affordable french skincare brands are ideal for this. As for night time cleansing this is where you want to be thorough and remove all makeup and clean the skin properly. If you've been wearing makeup then I'd highly recommend double cleansing, especially if you are prone to spots. First removing makeup with a solid balm cleanser and a warm damp flannel, as oil based cleansers remove makeup amazingly well and work on all skin types. Followed by a cream or liquid cleanser to ensure all makeup and grime is removed. Your skin should feel perfectly clean without feeling tight or dry. This is your toning step, but instead of a toner that doesn't do much, you actually want to go for an exfoliating acid toner that will magically remove dead skin cells - unblocking pores and improve skin texture. If you a new to this kind of product start with a light exfoliating acid in pad form (pre-soaked pads in a pot) sweeping a single pad over the skin after cleansing at night - Pixi, First Aid Beauty and Nip + Fab offer some amazing ones. If you aren't new to using liquid exfoliants then there are a whole host of products available to you, my favourite include Pixi Glow Tonic and La Roche-Posay Effaclar Micro-Exfoliant Lotion. Whatever you go for ensure you don't over do it (although you can build up your usage gradually) and wear sun protection as your skin will be more susceptible to sun damage. If you have bumpy/uneven skin texture, scarring from past blemishes or a dull complexion, you need a good exfoliating acid toner in your life! With an oily complexion it can be tempting to skip moisturiser entirely. But it's important to understand that your skin oil levels and your skin's need for hydration are two very different issues. My own skin type is oily however I couldn't be without a daily moisturiser as my skin would quickly become dehydrated, feeling rubbish and looking lack lustre, not to mention more oily! So the aim is to find a light moisturiser. If it doesn't soak into the skin quickly but feels heavy and greasy on the skin then it's not for you. Whether you think your skin is dehydrated or not, hydrating moisturisers are often light and gel-like in texture, working well for oily skin types. For oily sensitive skin types La Roche-Posay Hyreane Light Moisturizing Cream in a nice option, but my current favourite has to be Neutrogena Hydro Boost Water Gel Moisturiser which very much reminds me of Clarins Hydra-Essential range. Oily skin and spots often come hand in hand and although double-cleaning, weekly face masks and the use of an acid exfoliant can go a long way there will be times spots simply appear! For red/under skin spots a targeted spot treatment containing salicylic acid is a must! I've tried many over the past ten years and the one I've found to really work is Origins Super Spot Remover, it may seem a very small product for £15.00 but as so little is required per application it lasts over a year. For blemish-prone or congested areas, a good topical treatment that will prevent blemishes without drying out the skin is ideal. Again products can be hit and miss, however, Kiehl's Breakout Control Blemish Treatment Facial Lotion does deliver on its claims and I often apply it to my chin area to prevent breakouts once a spot has appeared. As for a targeted treatment for blackheads, there really isn't one! The best method to minimise the appearance of blackheads and the size of pores is to maintain a good cleansing routine and invest in an effective deep cleansing face mask, such as the ones below. Extracting blackheads or using pore strips are very much temporary measures and can dry out or damage the skin. To minimise shine and temporary oil secretion a good clay-based or charcoal face mask can work wonders! Perfect for an upcoming special event where you want your makeup to last, as a general pamper or around the time of the month if you find your skin becomes more oily/blemish-prone. Drugstore face masks for oily skin are becoming increasingly better, my favourites being L'Oreal Pure Clay Detox Face Mask and The Body Shop Himalayan Charcoal Purifying Glow Mask. As for face masks that are blackhead clearing they are few and far between and tend to be slightly pricey (but worth it if you want a super deep cleanse!). My favourite face masks that give results are GlamGlow Supermud Clearing Treatment and NIOD Flavanone MUD. I also find these two masks cut down oil production without drying out the skin for much longer than other face masks I've tried. Keeping a consistent skin care routine with the right products is crucial for oily skin! I hope this can be a good guide on how to put that together. Looking forward to sharing my favourite skincare products for oily skin over the next few months!